HarborLAB paddlers resting and rejoicing after we made it through The Narrows well ahead of the tidal current reversal. Photo by Erik Baard. 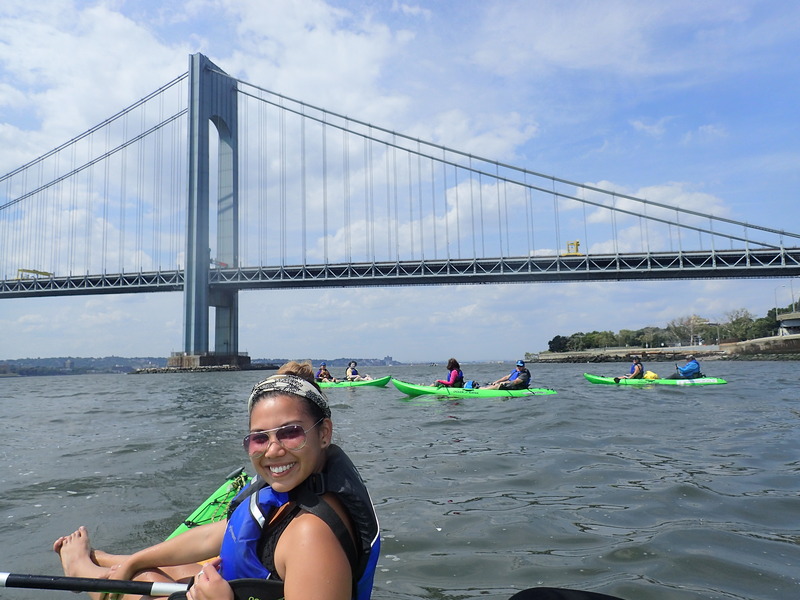 HarborLAB volunteers had an amazing Saturday, paddling 15 miles from our Hunters Point, LIC launch on the Newtown Creek to Coney Island Creek. We met our three goals of cleaning some of the beach there, planting thousands of native plant seeds and restoring the legendary Yellow Submarine to its joyful color. The weather was wonderful, and the crew was chatty and cheerful. We cruised with the ebb down the East River, through Buttermilk Channel and the Upper Bay, and finally The Narrows. We took Gravesend Bay stroke by stroke against a breeze, too far into open water to draw encouragement from marking our progress against the shoreline. At this point we noticed that James Covert had slathered on so much sunblock as to appear undead, like a “floater” had climbed aboard one of our boats! Such jocularity and seeing Coney Island’s landmark Parachute Jump emerge into greater detail buoyed our mood. Volunteers helped power the tandems of newer paddlers for the last, arduous hop. When we at last landed at Coney Island Creek Park, the heat beckoned us below the surface for a swim. We dove in, laughing and relaxing before advancing to our destination, the little peninsula at nearby Kaiser Park. 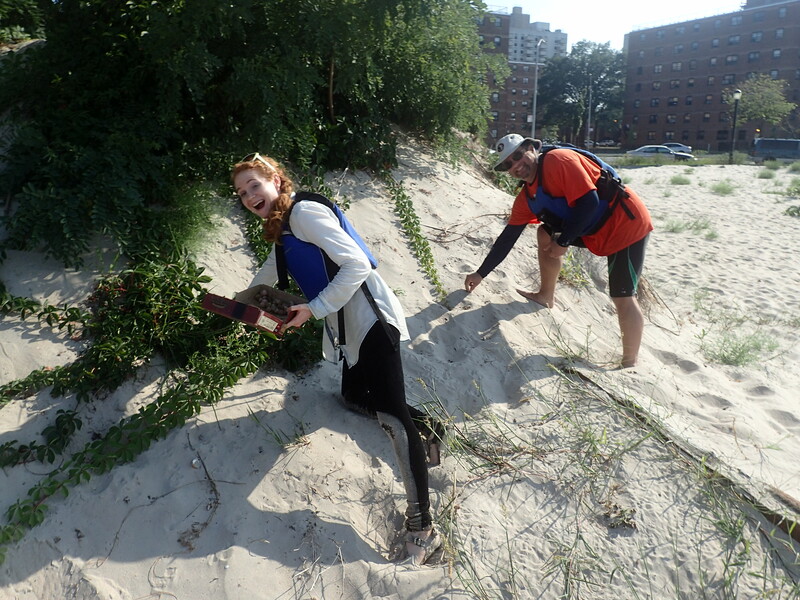 HarborLAB paddlers planting seaside goldenrod seed balls into dune bases at Kaiser Park on the Coney Island Creek. Photo by Erik Baard. At Kaiser Park our crew — especially Davis, Diana, Mariah Chinchilla, Swan Drsti, and James — picked up lots of trash. The American Littoral Society organizes annual local shoreline cleanups (September 19 this year), and as usual HarborLAB will clean South Brother Island. But HarborLAB found that these ALS events do such a great job communicating the need to reduce the plague of plastics in our oceans that we decided to perform this service and hands-on educational program far more often. A unique added benefit HarborLAB brings to its trips is seeding the shoreline. During the off season our volunteers partner with schools, corporate teams, and community groups to collect seeds and then together make seedballs (compost, clay, and seed). The Greenbelt Native Plant Center of the NYC Department of Parks and Recreation has also kindly donated seeds. On this trip we seeded Seaside Goldenrod and Coastal Little Blue Stem into the bases of dunes. Goldenrod faced the water while Coastal Little Blue Stem went between the street and the backs of the dunes. The cleanup crew mentioned above, plus Wendy Frank (better known as communications coordinator for the Five Borough Bicycle Club) planted well over 1,000 seed balls as infill between existing scrub, to provide protective cover for birds and other small animals, feed migrating Monarch butterflies and other beneficial insects, and stabilize the dunes. This simple act protects habitat and human homes alike. We’re very grateful to the Natural Resources Group of the NYC Department of Parks and Recreation for its guidance and permission to plant. Below is a video clip Erik shot of Monarch butterflies feasting on goldenrod nectar on South Brother Island. 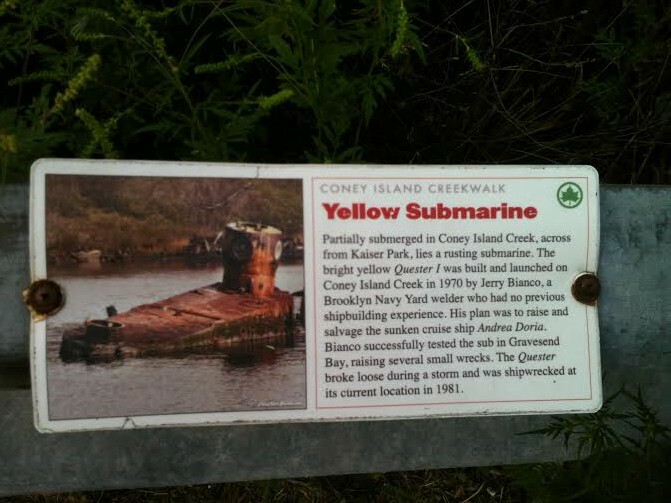 Informational sign about the Yellow Submarine provided by NYC Parks. Photo by Wendy Frank. Mairo, Miyeon and Shawn Cornell, and urban eco-artist Dee Dee Maucher (of the Masters of Succession Collective, and a supporter of HarborLAB’s green neighbor, Smiling Hogshead Ranch) showed particular passion for the task. We got the paint from the Newtown Creek’s own Green Depot. We chose an exterior paint that would be nontoxic and free of volatile organic compounds, and able to seal in the original, toxic industrial paint. You see, for all its appearance of sunny innocence, the Yellow Submarine was painted with zinc chromate, a carcinogen that also causes lesions. This paint also turns brown over time, compounding rust’s ruin of the submarine’s distinctive brilliance. The shade of paint we used was labeled “Sassy Yellow.” Perfect. We had a blast painting the submarine and might return to cover more area, and layer our first job. We focused mostly on the conning tower, the most visible portion of the vessel. But Mairo had the insight that highlighting the trim would convey much more of its shape and size for viewers at a distance. We paddled away feeling happy, imagining how kids might project their imaginations onto the now once-again more truly yellow submarine. 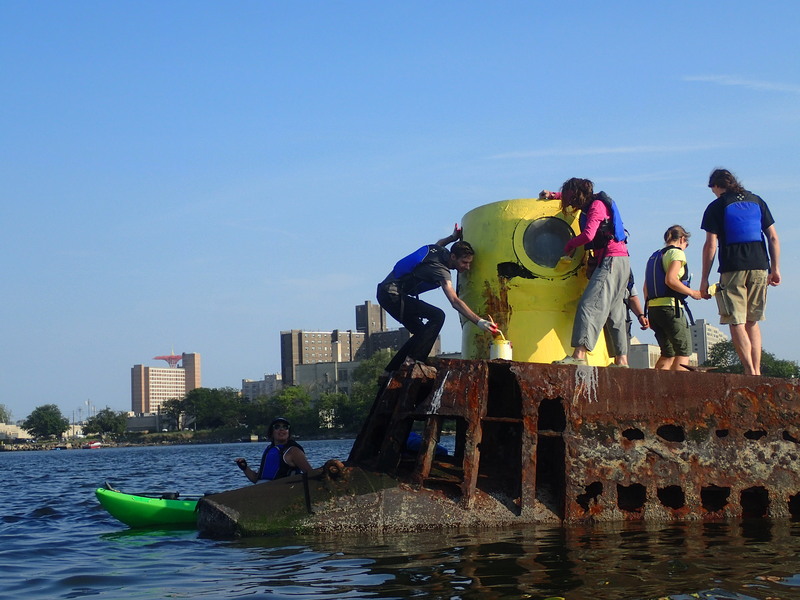 HarborLAB paddlers restoring the Yellow Submarine’s conning tower to its happy namesake color. Photo by Erik Baard. 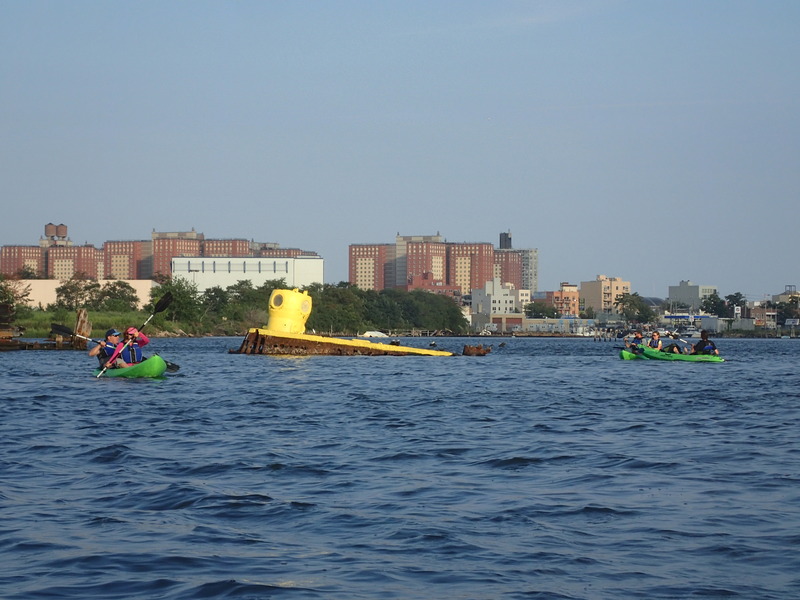 HarborLAB paddlers leaving a happier Yellow Submarine behind them as a gift to kids visiting Coney Island Creek. Photo by Erik Baard. September 5-6: Staten Island Eco-Edu Circ! 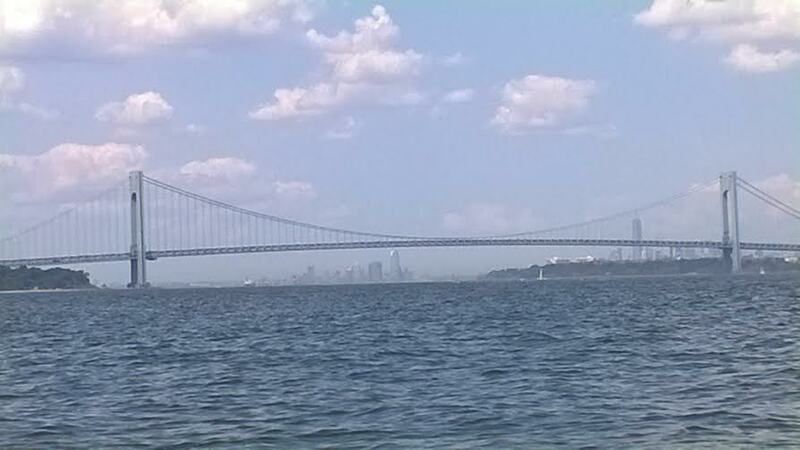 On Labor Day weekend HarborLAB will circumnavigate Staten Island by kayak, camping over on Saturday night. 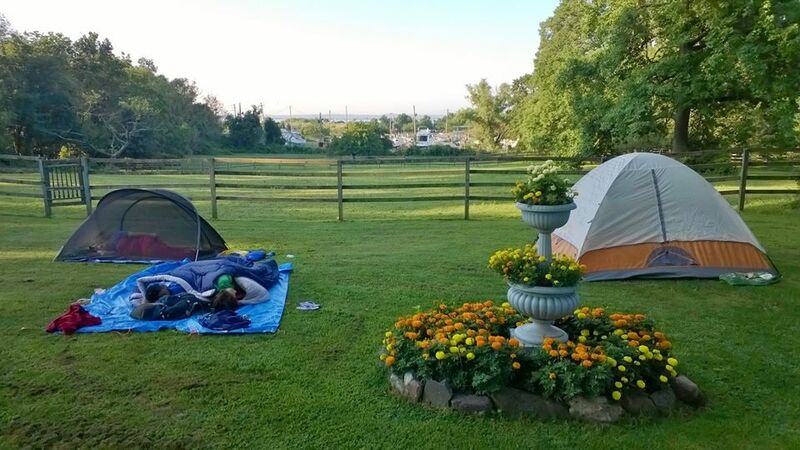 We have a public fleet and even tents for those without their own equipment. We postponed this trip from August 22-23 because we wanted to bring in more students and educators, as opposed to just ourselves and hobbyists. We have 20 seats in 10 tandem kayaks available, and welcome educators, environmental professionals, students, and community group representatives to fill at least half of those seats each day. The balance will be filled by committed volunteers. We also welcome paddlers with their own boats! What’s the big deal about circumnavigating Staten Island? Well, there’s no greater diversity to be enjoyed in a single outing in NYC. Let’s start with the sheer fun of it. You’ll see the skyline and great ocean-going ships, ruins and wrecks, marshes and open sea. 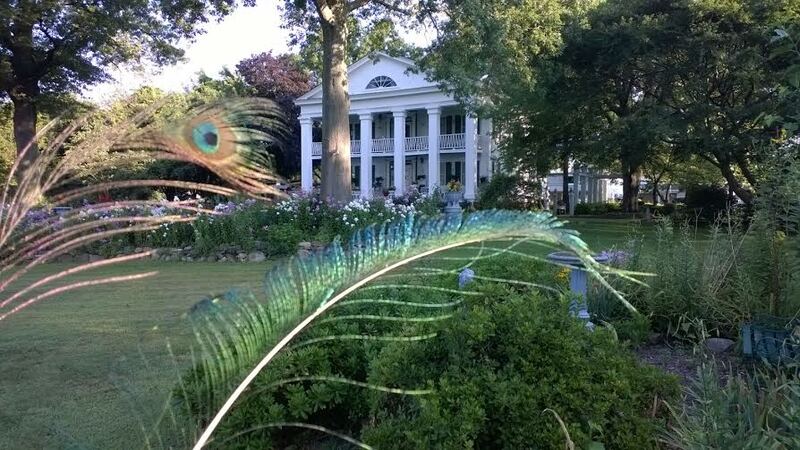 You’ll camp on the grounds of an 1818 mansion and wake to peacocks and horses, and a sweet Doberman Pinscher. You might even hang out at a biker bar! The waters you’ll paddle will vary from glassy to following seas and small breaking waves. As a student or educator, you’ll learn lots and discover places the promise rewarding returns for research or class outings. Several city, state, and national preserves ring the island. There are resources unique to NYC for all subjects, but let’s focus on ecology. Lemon Creek is the Bayou of NYC, winding from salt to fresh water with countless crabs and water foul to be seen in a setting of lush spartina. The Graveyard of Ships is a fascinating and photogenic study in nature reclaiming industrial relics, with ducks and osprey nesting in the wrecks. Turkey vultures perch on long-dead cobra street lights. Conference House has a history stretching long before its familiar role in the War of Independence, with fossils in churt rock dating back 300 million years. Ancient clay pit ponds a short stroll inland support amphibians, while just up shore a new habitat is being grown atop capped mounds of refuse. Sea mammals swim its eastern waters and highlands remain where glaciers ground to a halt. Along the way we’ll have pit stops. In some cases, quite literally: We’ll plant native beach plum pits with compost to help stabilize and enrich habitat! We’ll also plant other indigenous plants, like pokeweed, seaside goldenrod, and little blue stem. Interested? Please read the details below and email us at edu@harborlab.org with your interest. August 19, 2015. Final day this season for HarborLAB’s “Partner Paddles” with the Stanlet Isaacs Neighborhood Center of East Harlem. 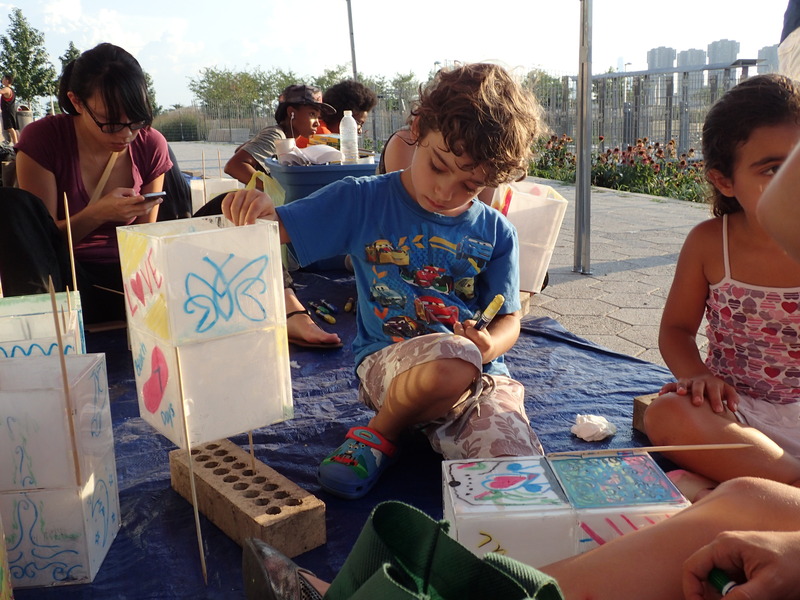 HarborLAB was back at Gantry Plaza State Park and Hunters Point South Park again, just days after Sunday night’s EcoBon floating lantern event. This time the sun was with us, even if the clouds were too. But brighter than our lanterns and the swaddled sun were the smiles of dozens of East Harlem kids from the Stanley Isaacs Neighborhood Center! Wednesday afternoon was our third and final “Partner Paddle” with the Center for 2015. We served nearly 100 kids over those three sessions, introducing them to the estuary and sending them home with literature and posters from the Hudson River Foundation. 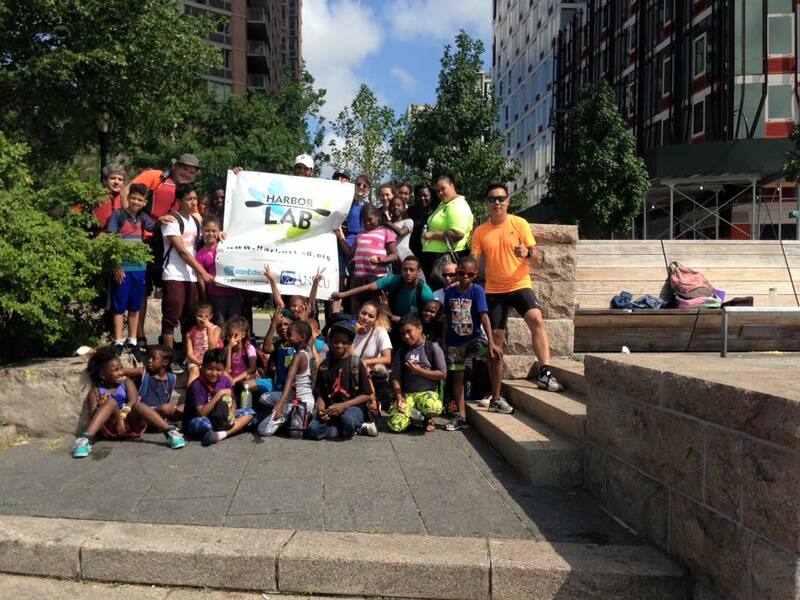 We scheduled the kids and Gantry Plaza State Park access through the Waterfront Alliance. In addition to the kindness of New York State Office of Parks, recreation, and Historic Preservation, we relied on the NYC Department of Parks and Recreation for Hunters Point South Park spaces for the kids to play and sun dry. Our programs are made possible by our sponsors, and at Gantry Plaza State Park that’s especially TF Cornerstone, New York Waterway, and Con Ed. As always, our volunteers produced the program with joyful hard work. We have a wonderful community. Patricia Erickson, Damian Griffin, Scott Wolpow, Richard Furlong, Erik Baard, and Ray Tan were joined by stellar volunteers from Etsy. The online crafts and fair trade company volunteered at our site earlier this summer too, and we hope it’s the start of a friendship! The first annual “EcoBon” ceremony was a great success. HarborLAB conceived, produced, and promoted this creative interpretation of an ancient rite called Obon to promote environmental awareness and bring a beautiful experience to a broader community. Hundreds of visitors to Gantry Plaza State Park and Hunters Point South Park enjoyed viewing our 100 floating lanterns on the East River with the Manhattan skyline and United Nations as a backdrop. We received great media coverage, links to which we’ll continue to add..
Our lanterns were truly innovative, and were decorated with nontoxic, washable window crayons and markers so they can be reused. Images ranged from pictures of favorite plants and animals to direct messages. The materials were largely plastics that would have either gone into landfill or required energy to recycle. Half of the lanterns were made from used CD cases lightly painted on the inside using a Green Depot-sold product without volatile organic compounds or other toxins. From a distance they looked amazingly similar to rice paper lanterns. The other 50 lanterns were in fact rice paper. All were mounted with reused bamboo skewers that we’ll continue to use for years to come. Buoyant bases were polystyrene squares normally discarded by film distributors after serving as reel packing dividers, but instead were donated through NYC WasteMatch. The same bases have been used since 2002, when HarborLAB Founder Erik Baard and Dr. Rev. Toshikazu Kenjitsu “Rev. TK” Nakagaki, Vice Chair of the Interfaith Center of New York and President of the Buddhist Council of New York, began an annual 9/11 ceremony on the Hudson River. That tradition became decadal in 2011. 2015 EcoBon (environmentally-themed Obon ceremony) by HarborLAB. Photo by Erik Baard. Japanese families seek reconciliation with their ancestors in the Obon season, and give an accounting of their lives to the spirits they believe have returned. Other Buddhist cultures have similar lantern ceremonies. HarborLAB has a purely secular focus on science, but we respect that spiritual traditions bind together and ethically inform many of the communities we serve. Engaging faith congregations in environmental action will be vital to future efforts, from habitat protection to CO2 reduction. This year LIC’s own New City Church Pastor Patrick Thompson spoke alongside Rev. Nakagaki, who invited musician KenYa Kawaguchi to accompany meditation on a bamboo shakuhachi flute, As EcoBon grows, we’ll invite scientists and clerics through research labs and the Interfaith Center of New York to speak about how we can account for our lives on this planet. Making EcoBon happen was a very heavy lift. We had hoped to produce the ceremony this year, but by August had written off the chance. Then one week before the date key elements came together unexpectedly and we seized the opportunity! This event was hugely strengthened by 56 student Resident Advisers from Fairleigh Dickinson University’s Florham campus, coordinated by the Office of Campus Life. Even more heartfelt gratitude to our regular volunteers, especially Patricia Erickson, Phillip Borbon, Lidiya Kan, Zak Ahmed, Dorothy Morehead, and Lynne Serpe. Especially those who helped prepare and pack away this very involved and detail-saturated production. Thanks to Davis Janowski and Winnie Hu for sponsoring some of the art supplies! We’re thrilled to have met, and thankful to, new volunteers and teen siblings Johnell and Johnna Artis. They just moved into LIC, we owe them an amazing paddle tour with the FDU students for hopping in so helpfully! Columbia University graduate engineering student Josue Silvestre not only helped at this event, but each week samples and tests water at Gantry Plaza State Park for HarborLAB as part of the “citizen scientist” water quality project coordinated by the NYC Water Trail Association and The River Project. 2015 EcoBon (environmentally-themed Obon ceremony) by HarborLAB. Photo by Lidya Kan. Many thanks also to the New York Office for Parks, Recreation, and Historic Preservation, the NYC Department of Parks and Recreation, and the Waterfront Alliance for making the event possible, afloat and ashore. We thank all of our sponsors, and for western Queens events like this, especially TF Cornerstone and Con Ed. We also appreciate Hunters Point Parks Conservancy Vice President Mark Christie’s encouragement to have FDU cater student affordable and delicious meals with COFFEED LIC Landing. Now that we know we can produce EcoBon across from the UN, we’ll make it an annual event (August 14, 2016!) and have a much longer time for preparation. To ease logistical strains and volunteer burdens, and avoid too much baking in the sun, we’ll have kids and families decorate the lanterns at community centers and youth programs in July and early August instead of the same day as the ceremony. We’ll invite special event sponsors and partner with Japanese and artistic foundations and groups. In short, we’ll always remember the volunteers who sweated through the hard work of the first EcoBon so that bigger, easier, and better ones might follow! 2015 EcoBon (environmentally-themed Obon ceremony) by HarborLAB. Photo by Lynne Serpe. Obon floating lanterns on the Hudson River in a ceremony produced by Dr. Rev. TK Nakagaki, Erik Baard, NY Kayak Co, and NY de Volunteer. Photo by TK Nakagaki. HarborLAB, Gantry Plaza State Park, Hunters Point South Park, and Fairleigh Dickinson University have partnered to produce the kid-friendly EcoBon Floating Lantern Festival: Reflections on a Peaceful and Healthy Planet. On Sunday, August 16, the public is invited to decorate 100 lanterns made from reused materials with pictures and messages of hopes and concerns for local and global ecologies. Public viewing follows. 3PM-6PM: Public decorates lanterns in Hunters Point South Park at 50th Avenue. Guided by Fairleigh Dickinson University, Florham Campus Resident Assistants. 7:53PM: Sunset. 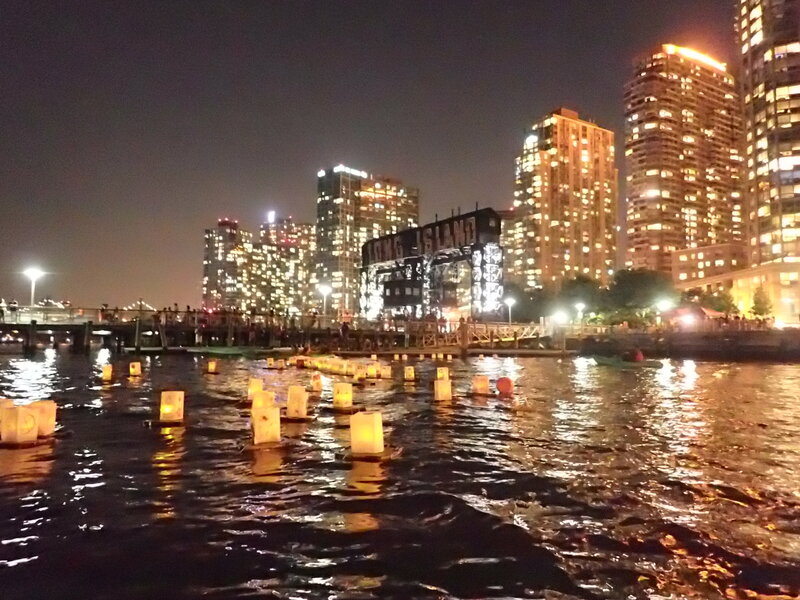 Lanterns floated from Gantry Plaza State Park dock at 50th Avenue. 8:30PM (approximately): Last lantern placed by Dr. Rev. Toshikazu Kenjitsu “Rev. TK” Nakagaki, Vice Chair of the Interfaith Center of New York and President of the Buddhist Council of New York. Rev. TK offers remarks for contemplation. 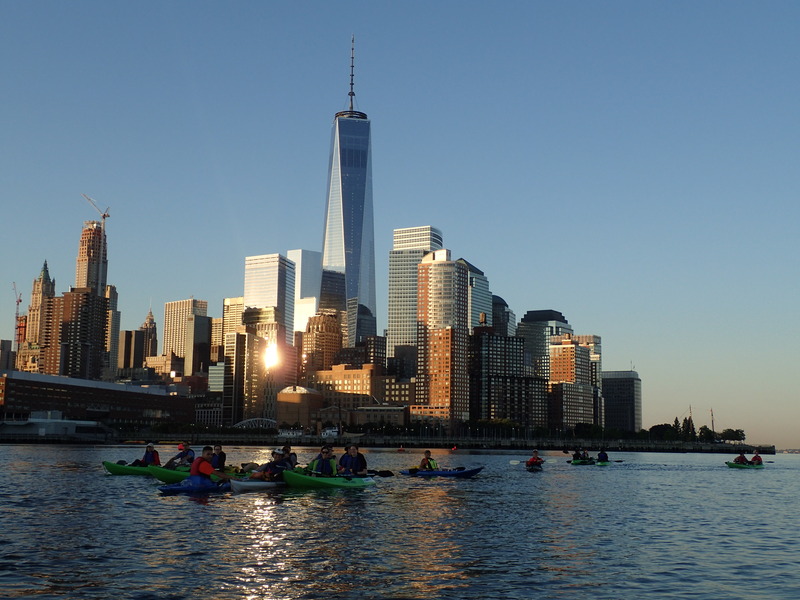 HarborLAB, based in LIC, produces paddling programs for social and environmental good. The Obon ceremony is an ancient Japanese summer rite of remembrance and reflection. 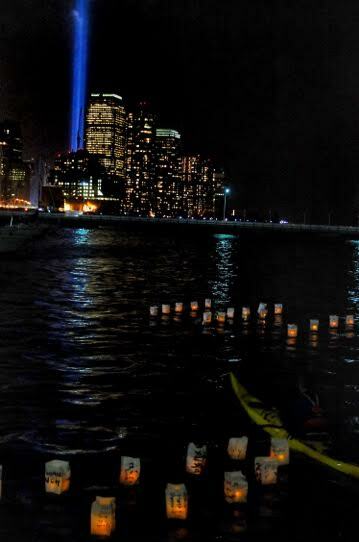 HarborLAB conceived EcoBon based on the 9/11 Hudson River Obon initiated by founder Erik Baard and Rev. TK Nakagaki that was annual from 2002-2011, and is now decadal. Lanterns are made from used CD jewel cases provided by Murfie Music and film reel packing foam provided by Wah, Inc. through NYC WasteMatch. “We’re excited to reuse plastics to create a beautiful display of environmental messages in view of the United Nations. Since the atomic bombings 70 years ago, Obon lanterns have carried messages of peace. We now know that hopes for peace and a healthy planet are intertwined,” said Erik Baard, founder of HarborLAB. HarborLAB is grateful to the Waterfront Alliance for coordinating public water access at Gantry Plaza State Park with the New York State Office of Parks, Recreation, and Historic Preservation. HarborLAB especially thanks Founding Sponsors TF Cornerstone and Con Ed for making Queens eco-educational boating events like EcoBon possible. We seek additional sponsors and volunteers for this and other exciting programs throughout NYC. To join us, please email support@harborLAB.org or volunteer@harborlab.org. Obon floating lanterns on the Hudson River in a ceremony produced by Dr. Rev. TK Nakagaki, Erik Baard, NY Kayak Co, and NY de Volunteer. Photo by Kazumi Terada. Obon floating lanterns on the Hudson River in a ceremony produced by Dr. Rev. TK Nakagaki, Erik Baard, NY Kayak Co, and NY de Volunteer. Photo by TK Nakagawa. HarborLAB volunteers have the joy of introducing kids from the Stanley Isaacs Neighborhood Center to the estuary this summer. 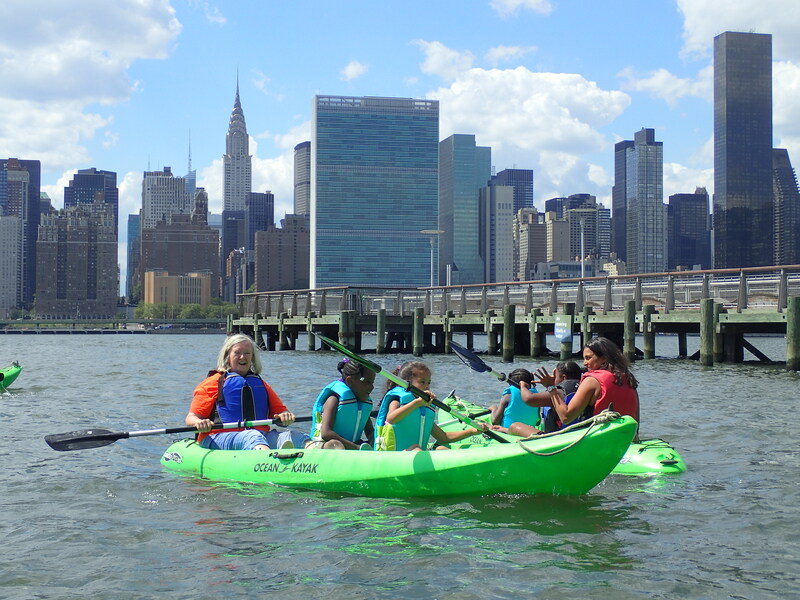 The kids paddled at Gantry Plaza State Park and played and dried off at Hunters Point South Park. We’ve hosted two sessions for a total of 60 kids so far, with another 40 coming on August 19. This fun volunteer endeavor is made possible by the New York State Department of Parks, Recreation, and Historic Preservation, the Waterfront Alliance’s summer Harbor Camp program, and our Queens event sponsors, especially TF Cornerstone and Con Ed. We are excited to offer more dates before we wrap up in the autumn, so email volunteer@harborlab.org to help make the learning and fun possible! HarborLAB’s overnight circumnavigation of Manhattan for the American Foundation for Suicide Prevention. Photo by Phillip Anthony Borbon. HarborLAB’s overnight circumnavigation of Manhattan for the American Foundation for Suicide Prevention. Photo by Carolin Zayas. HarborLAB’s annual “Here Comes the Sun — Voyage” was a joyful adventure that raised $800 for the American Foundation for Suicide Prevention. Many thanks to Gothamist for promoting this event and providing helpline numbers with each article about suicide. Our evenly divided crew of a dozen volunteers and a dozen new friends launched at 10PM Saturday from Hunters Point, LIC into darkness that was quickly riven by the dazzling Manhattan skyline and reflection on the East River. Cheerful hollers boosted us from COFFEED LIC Landing, Hunters Point South Park, and Gantry Plaza State Park. The sky’s inkiness was soon diluted by the Blue Moon as it vaulted higher. We continued for ten hours and thirty miles into a brilliant Sunday morning. Our crew performed beautifully and conditions were placid, punctuated by a few fun wakes. Most of us used HarborLAB’s core public fleet of bright green Ocean Kayak Malibu 2 XL tandems, with four solo guideboats. A passing sightseeing boat sent breakers into us as we crossed to Manhattan from Roosevelt Island’s northern stake, Blackwell Lighthouse. We replied with hoots and hollers that bounced through Hell Gate. The Circle Line captain kindly relayed our presence to others due to pass through, far beyond the range of our handheld radios. The hardest work, as always, was muscling through the slack at the eastern end of the Harlem River, but by the time we passed Yankee Stadium the current was sweeping us along. Crackling voices over our marine radios subsided as the chatter of our own bonhomie rose. Shouts of greeting poured over the bulkheads of East Harlem, the South Bronx, and Inwood. Fireworks burst and sparkled over us as we approached the newly restored High Bridge. 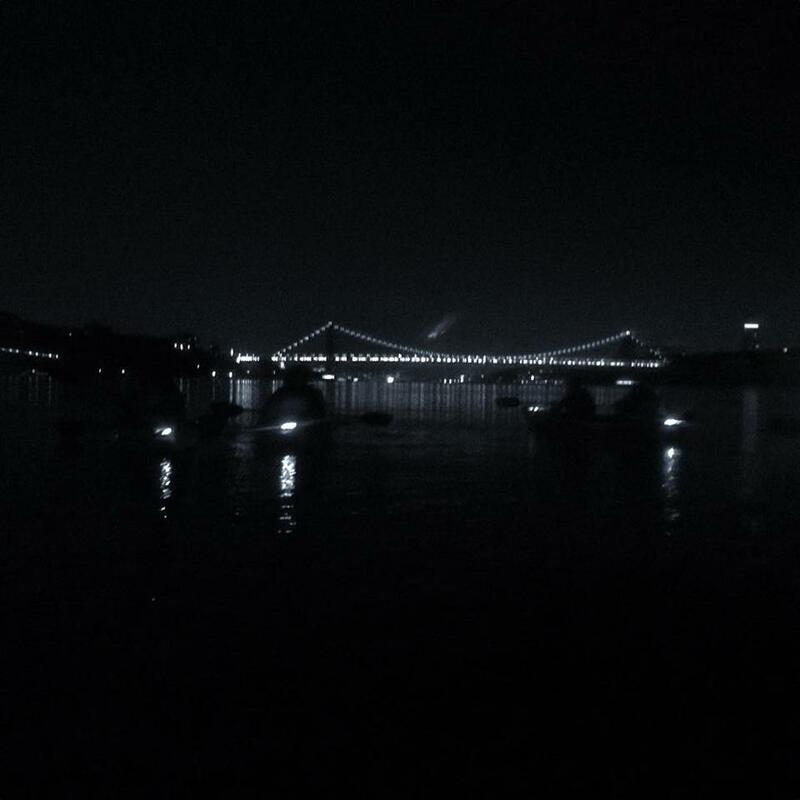 The bridge’s illumination rippled milky white down the Harlem River’s aisle like a bridal train in ribbons. Shortly after we took a rest at the Peter Jay Sharp Boathouse dock. From there, we saw Mannahatta rise before us “Forever Wild” and alive at Inwood Hill Park forest, which was never felled. The other bank was the 1.1-billion-year old Nipnichsen (“two waters” is one translation) Fordham Gneiss rock face, where sometimes you can see Bronx youth test their courage by cliff diving. The Harlem River empties into the Hudson River at a sharp perpendicular. The expansiveness of the Hudson River stretching away from each paddle blade always startles. Some paddlers gasped to emerge from the snugness of the Harlem River strait at Spuyten Duyvil into the mainstem of the estuary. The Palisades’ 200-million years-stilled lava was a black wall a half mile before us, while we barely spied upriver the vague humps of the Hudson Valley’s old, worn ranges. Or did we conjure them from memory? One long squiggle of a cloud looked like a comet as it caught the moonlight above the river. Downriver our distant skyline still coolly blazed, with the spires above Times Square changing colors. Before 4AM we landed at the 79th Street Boat Basin. We radioed ahead to the dockmaster on duty, who is an exceedingly gracious and helpful young man. He makes our visits every year easier and more pleasant. After a pit stop for the necessaries, our group scaled the hills overlooking Riverside Park to eat at a welcoming 24-hour pizzeria and deli. In a truly New York chance encounter, a pitchman for PickleAde (a pickle juice solution for muscle cramps) loved our cause and spirit of adventure. The pickle man distributed free samples of the briny elixir and HarborLAB operations chief EJ Lee guzzled them to sluice down Oreo cookie-topped chocolate cake, igniting jesting rumors of pregnancy. We tucked into the Manhattan Kayak Company paddling embayment next to the USS Intrepid after we safely scooted past the cruise ship terminals in midtown. We were glad that our plan to be gone before the brobdingnagian boats berthed worked out so well. We saw their procession from The Narrows, with the lead ship passing us near The Battery. The sun gleamed off the World Trade Center in the first minutes of full daylight, washing our little armada in reflected vermeil light. The Battery’s bulkheads reflect all wakes and waves, but there were none to strike them that quiet morning. Only fishing lines and huffing joggers above. We glided on even after the ebb tide had faded, nudged out of the Hudson at last by downflow that started from Lake Tear in the Clouds. We coordinated rounding The Battery with friendly Governors Island and Staten Island Ferry captains by marine radio. HarborLAB’s overnight circumnavigation of Manhattan for the American Foundation for Suicide Prevention. Photo by Erik Baard. We peered down Buttermilk Channel for tugs and barges and the Sea Streak ferry from Sandy Hook, NJ. Nothing was moving. No silhouettes of larger vessels eclipsed the sun glare up the East River either, even as spots. Scouting was much easier in the morning and along straighter passes than at the darkened bends of Hell Gate hours back, We crossed directly to Brooklyn from the Financial District heliport. Passing under the Brooklyn Bridge was breathtaking, and through its stitchwork of cables we last saw the last of the moon. The flood tidal currents were burgeoning, and swiftly dropped us at Dumbo Cove. Some hopped ashore for relief while most bobbed before the glass cube-encased carousel. We were ahead of schedule and had earned some rest, so we drifted and chatted for much of our final leg. The Manhattan skyline was softly glowing in natural light, and seemed renewed. Brick buildings and stone bridge stanchions exuded warmth. Early risers greeted us from the new piers along the Williamsburg and Greenpoint reaches until we swung out past Greenpoint’s longest dilapidated pier. The shoreline then curled into the Newtown Creek and we were home. Many thanks to all who participated and supported this wonderful event, and who helped us with the chore of stowing gear away after. The work was made light by laughter. Before long the crew dispersed to their beds across boroughs and states. One volunteer stayed behind to water our trees in blissful solitude. HarborLAB’s overnight circumnavigation of Manhattan for the American Foundation for Suicide Prevention. Photo by Christopher Spoooner. 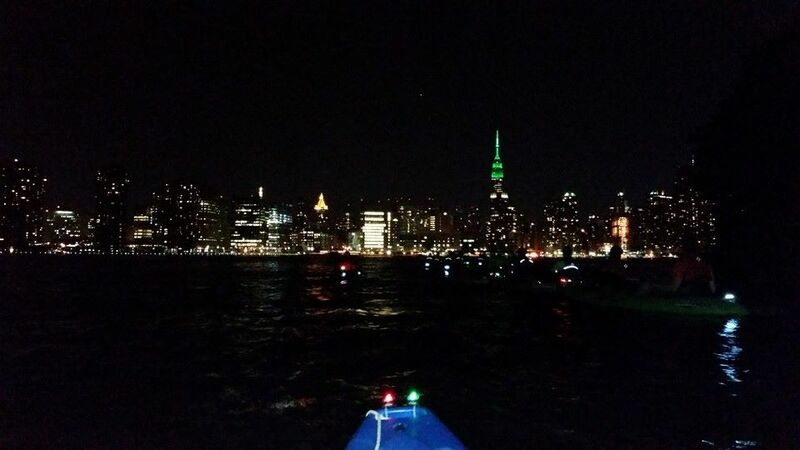 HarborLAB’s overnight circumnavigation of Manhattan for the American Foundation for Suicide Prevention. Photo by Davis Janowski.